We still had 2 great challenges to overcome in the morning. 3 if you include getting the boys up, getting their faces washed, their teeth brushed and into some form of clothes. Then it was off to one last big adventure. The first challenge was the ongoing battle with the hotel staff over face cloths. The 2 they left us were just not enough. So every night I would phone down and ask for more face cloths. Now maybe this is a weird language thing. Maybe the americans call them wash cloths, or face wash-washies or gun cloths, but every time I ordered some, I just never knew what I would get. Or, to be fair, with my braces on, they may have heard ‘faith clouds’ or ‘fade gloss’ or something like that. 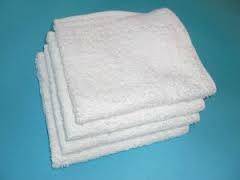 One time a nice maid delivered about 10 small towels. One time, despite asking for 6, one was sent up. Another time, a harried-looking janitor gave me an armful of them (and the Prettiest-girl-in-the-world was not convinced they were that clean.) One time when we came back, we found that they had taken all of them away. All. That’s ok. It took a few tries sometimes, but we got our face cloths in the end. And the Prettiest-girl-in-the-world being kind and empathetic, refused to believe my stories about the maid conspiracy and when we finally departed, she left them a nice tip for all the hard work they did on our behalf. It’s something I would never have even thought about. Nor did the boys either. It’s why we need the Prettiest-girl-in-the-world with us. She is simply a nicer person. So second problem: If anyone remembers about 400 posts ago, I mentioned Allegiant Airlines had a pretty strict baggage policy. Their biggest bag can only weigh 40lbs, but L+W+D can be an astounding 80”. I’m pretty sure if we cellophaned up the youngest, he would be qualify, but apparently they have restrictions against shipping children in the baggage compartment. Their other bags are, 9x14x22 for carry-on, and 15x7x16 for personal bags. If we failed to meet those specs, the fines were hefty. A billion dollars or something like that. So we knew this trip back was going to have a lot more stuff. But, to be fair, we knew this was going to be a problem, so the night before, we went out to Target (the last ‘t’ is silent in Canada). We bought another carry-on and then paid an extra $40 or something to add it to our Allegiant Baggage total. 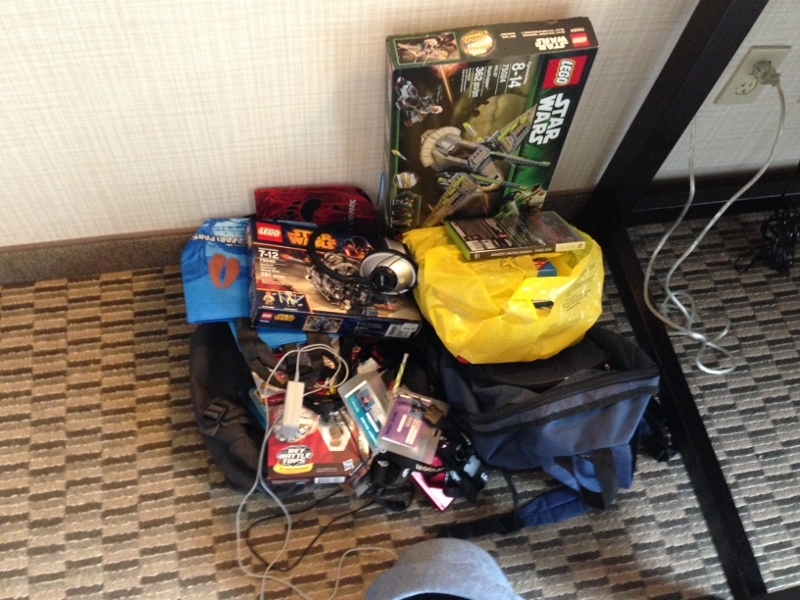 However, as we packed in the morning, it became apparent that the extra bag would not be enough. We stuffed the boys’s small backpacks full of clothes and heavier things. Sure this would double their body weight but everyone was taking one for the team at this point. We then threw out all the HBA (in my old business, that was health and beauty aids), including all the hotel shampoos and lotions and mouthwash I’d stolen over the week. We sat on the bags to make sure we could zip them shut. Then we lifted them up and did our best to eye-ball their weight (or arm-ball them?). My best guess was the big bag weighed about 200 lbs. The others seemed fine even if the boys bags looked like airbags ready to explode. If we were over, though, I had a plan. I could wear about 6 pairs of underwear, two shirts, and probably stuff a couple of socks down my pants. I offered to do the latter anyway, but the Prettiest-girl-in-the-world didn’t warm to the idea. The boys could wear extra clothes and stuff lego in their pants. The Prettiest-girl-in-the-world could fill her purse with sweaters, zoo cups and extra bras. So, with nothing left to pack, with the room cleaned up, the vital air freshener left in the bathroom for others to use, the used face-cloths stacked neatly, if somewhat damply, on the side of the tub, we gave the room one last tour, then left. 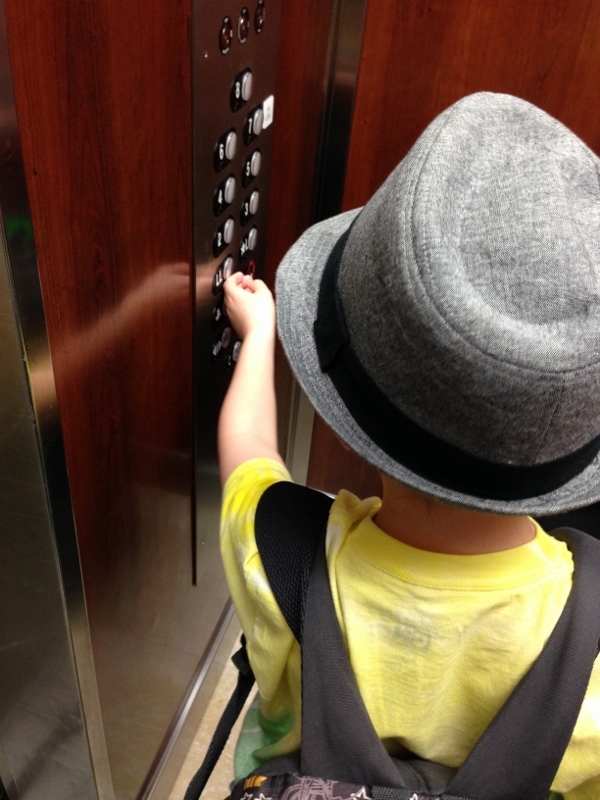 The youngest – being in charge of elevator button pushing on this trip – pressed the down button one last time. 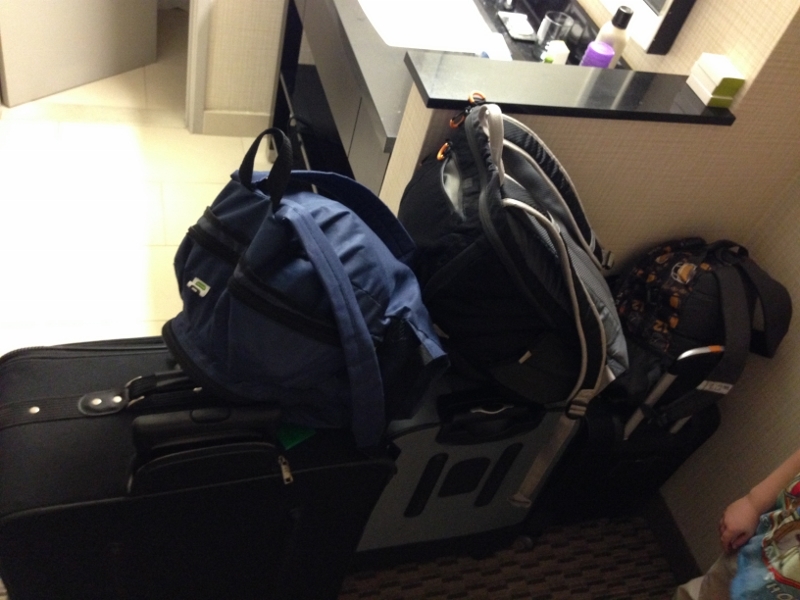 Then we settled up and lugged our luggage to the car. I have no idea how I fit it all in the trunk, but I did. Even the oldest looked impressed. The youngest said he could have done it faster. The only issue now was would we all have enough energy to do Balboa or would the 6 days of non-stop tripping take its toll on us? This entry was posted in Blogging, Parenting, San Diego, Travel, Traveling with Kids, writing and tagged allegiant airlines, baggage limits, boxes of lego, face cloths, gun cloths, hotel doubletree, humor, humour, lego, luggage, maids in hotels, prettiest girl in the world, wash cloths. Bookmark the permalink. Hey, Joe. I got Alison a combination travel alarm and baggage scale from LL Bean and it’s quite nifty. I don’t see it anymore, but you might want to consider one of these: http://www.llbean.com/llb/shop/76888?feat=203-GN1&page=balanzza-mini-sport-digital-scale&attrValue_0=Multi&productId=1269892 .